Well, it looks like our drought is going to be continuing into it’s 4th year. To add on to the lack of rain we have record temperatures exacerbating the drought, further stressing plants and melting any snow that may fall soon after it falls. California will likely have no backup in regards to snow melt that we normally rely on for our summer water needs. The biggest question garden-loving Californians are asking right now is “Should I even grow a garden this year with this drought?” It’s a responsible, well meaning question. I asked it myself last year. I went back and forth about it. A garden increases your water use, but at the same time you don’t want to let all your hard work die. And then it dawned on me as I was driving by agricultural fields being irrigated by overhead spray in the middle of the day. I’m going to be eating food anyways that requires water use. If I grow it I can control how much water is used better than a large scale farmer can. I can actually reduce my water use through food consumption more if I grow it myself. The LA Times recently had an article about how much water is required to grow certain foods (if you eat meat, goat takes the top spot for least amount of water needed per pound of meat). An apple requires 18 gallons and an orange requires 13 gallons. That’s quite a bit of water for just one fruit. Potatoes require 119 gallons of water for a pound. Yikes. In addition to having to eat, using water in your own yard will help keep your soil healthy and alive, while also providing much needed habitat for wildlife. My guilt of growing a garden subsided a bit. Now it was time to figure out what I can do to reduce my water footprint even more. I hope these tips can help you as well. The only exception to this is if you are on a well that may run dry. If that is the case reduce, or even eliminate, your garden and just focus on keeping your trees and perennial plants alive. One of the keys to water wise gardening is to know what kind of soil you have. 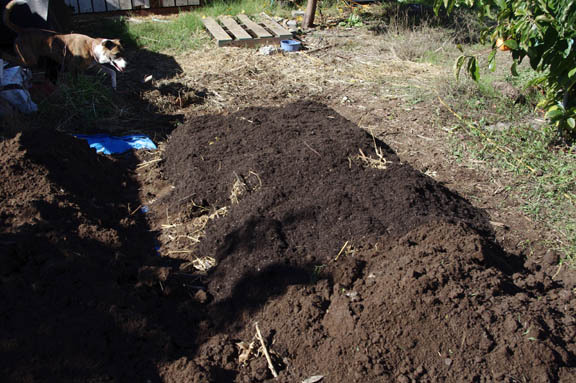 If you have raised beds you most likely have a soil that is high in organic matter and maybe even has a bit of topsoil. If your beds aren’t brand new you’re going to want to get your soil tested so you know what nutrients you need to add. Plants that are getting enough nutrients are going to be hardier and will weather the drought better. If you plant in the ground like I do you are also going to want to know the soil’s structure. 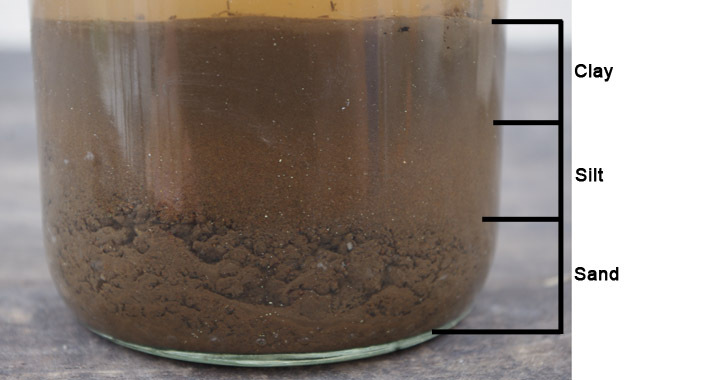 How much sand, silt and clay does your soil have? Sandy soil doesn’t hold water very well while clay soil has a tendency to hold onto water too well. In addition you can check out the Web Soil Survey through the USDA (push the green button). This will give you an idea of how deep your soil is, which directly effects how much water it can hold. It will also tell you the water holding capacity of your soil. For the record, our soil is 20-40″ deep but only holds 4.5″ of water, which means that if it rained 6″ the soil would only be able to hold 4.5 of them and the remaining 1.5″ would run off or flooding would occur. Also, the water table is over 80″ deep so I can depend on trees being able to access it, as most tree roots actually only go down 2-3′. Starting from the ground up we first want to make sure our soil is well amended with a lot of organic matter. Organic matter will help absorb and hold onto more water. It will also help provide enough nutrients for the plant to develop strong root systems. Organic matter helps fast draining sandy soils hold onto water and helps heavy clay soils distribute the water deeper to the root zone and makes it more available to the plant. If you have tested your soil through A&L Agricultural Laboratories they will offer you recommendations of what to add to your soil to grow the desired crops. 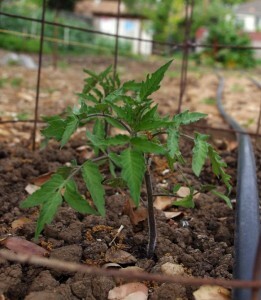 A tomato planted at the emitter location on drip tubing. Fortunately for us, we are already on the right track. Our entire property is on drip/micro irrigation. 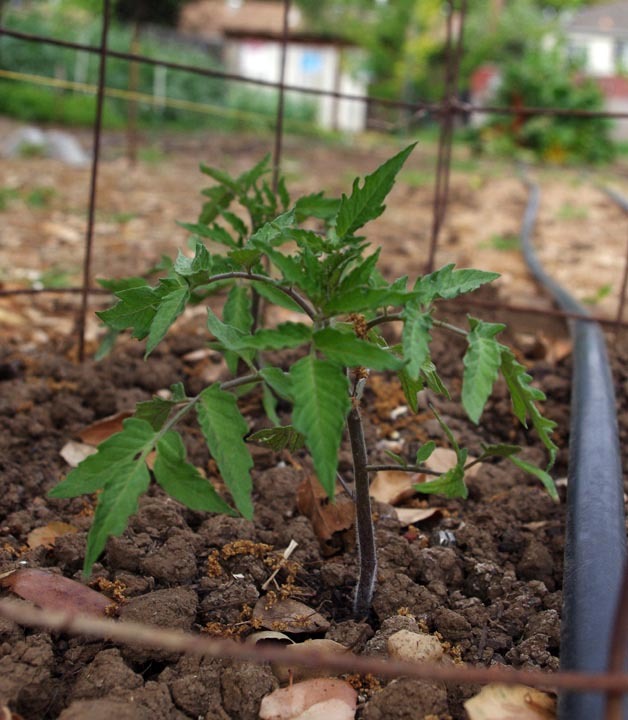 If you don’t have your vegetable beds on drip, now is the time to invest. A drip system does several things. It reduces the amount of water you use while watering by 50% or more. It reduces diseases caused by overhead watering. It reduces problems with weeds. It reduces the amount of time you spend watering. It reduces runoff and erosion. If you don’t have a drip irrigation system yet and don’t know how to put one in, I’ve got a pretty thorough tutorial that can help you. Once you have your driplines in, situate plants so that they occur at an emitter so the plant can fully utilize as much water as possible. And instead of watering a little bit every day, water heavily but less often. You want the roots to travel as far down as you can get them to go. Plants with shallow roots are more likely to get dried out and stressed. Most plants require an inch of water per week. My aim is to water with drip 30 minutes twice a week. Of course the length and frequency of watering depends on the drip components you use. Many manufacturers offer calculators to determine how long and often you should run your irrigation. In addition, to reduce evaporation, schedule your irrigation to come on between 7pm and 7am. Early morning hours are preferable. Mulch the hell out of everything you plan to water. And I mean MULCH. Lots of it. Go for at least 4″ if the plant’s height allows. Straw is a cheap mulch that you can use though it does get slick when wet and has a tendency to blow around. Bark mulch is heavier and longer lasting but can be expensive unless you get it from a tree service. However, getting it from a tree service can limit you to getting mulch from whatever tree they just removed. Some tree species can cause problems in the garden such as black walnut and eucalyptus. So far, one of the best mulches that I have found for water retention has been old livestock bedding. It’s heavier because it has absorbed urine and feces (which also increases it’s fertility) so it doesn’t blow away and it’s finer in texture from being broken up by hooves so it doesn’t have as many air spaces to allow evaporation. If you don’t have livestock you can get old bedding from horse stables, which are usually giving it away for free. Just be careful about weed seeds. Horses that are stabled tend to have less weed seeds in their feces than pastured horses. I’ve used rice hull bedding from a local stable before and this stuff was fantastic. You can also save up dried leaves and use those as well. We tried out plastic mulch/sheeting one year and found that it helped hold onto more water than expected. It also helped heat up the soil for plants that preferred warm soil. Melons and watermelons really thrived with the black plastic. The more drought tolerant plants such as tomatoes, didn’t fare quite as well. Make sure to lay the mulch over your irrigation lines. You don’t want to actually water the mulch because it will absorb all the water and not allow any to reach the soil and water your plants. 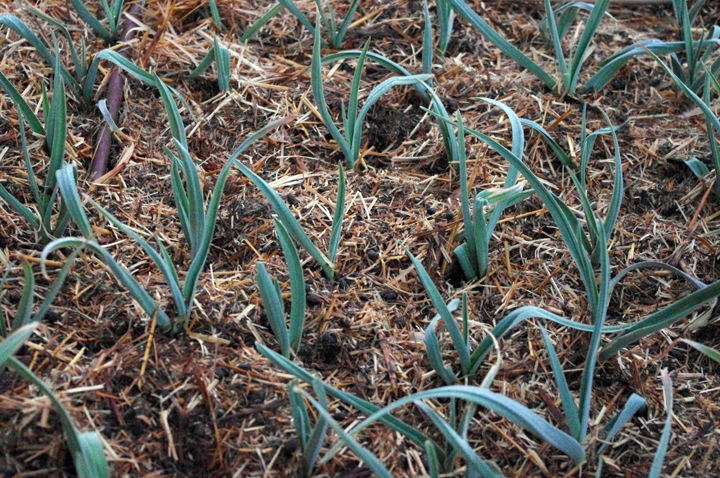 You also don’t want to have mulch right up against the stems of most plants (onion family and potatoes plants tend to be the exception) as it can cause problems with rot. An inch or so away is fine though. Not all vegetables are created equal. Some, like celery, onions, green beans, carrots, lettuces and melons require a lot more water than other vegetables. Squash, tomatoes, peppers, eggplants and dry beans, especially Tepary beans, chard, and arugula are better choices for gardening when water is restricted. Most plants also have critical periods where they will require more water than normal. Most of the time this is during flowering and fruit production. If you really want to grow some of the higher water need plants, put them together on a separate water valve. That way you can have part of your garden getting more water than the rest rather than the entire garden getting more water than some plants need. Also space the plants farther apart so they aren’t competing with each other for each precious drop. You may end up with fewer plants, but you won’t have to water as much. The above picture with all the squash is a perfect example of how water wise gardening can still be productive. 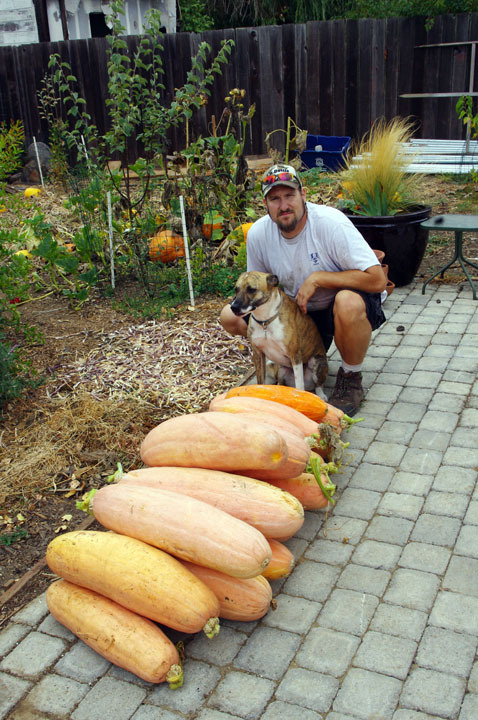 All of that squash – each weighing approximately 20lbs – came from a single volunteer plant. It sprouted in our old chicken yard so the soil had lots of organic matter and a high nutrient content. Because it was a volunteer we didn’t have irrigation going to it and only ended up giving it two deep waterings early on in it’s growth. It was a wetter year then compared to now, so the soil had a larger water capacity than this year, but it goes to show that if done correctly and mindfully very little applied water can still result in a big harvest. We have a lot of volunteer vegetable plants that grow in our yard. Most of the time they are in our beds, but sometimes they are growing elsewhere that won’t be getting any water. These vegetables are the ones that do best in drought conditions because they don’t need the extra water. Chard, squash, arugula, and tomatoes are the most common ones growing about our yard. Also artichokes are very drought tolerant. Their growing season is in the winter and spring and then they die back in the summer and go dormant until the rains return. We rely 100% on the rainy season for our artichoke plants. We’ve never watered them until this year. They and the trees are now getting the water we save. If you have a small yard or balcony and still want to grow some of your food, container gardening can be done even in a drought. Follow many of the same guidelines as outlined above but you also want to take care regarding the type of container you are using. Terracotta planters are going to dry out a lot faster than plastic or even glazed pottery. Also, utilize saucers under your pots to catch excess water. An even better system would be to invest in or make self watering containers. These only release water as the plant needs them and are low water use. We now have several 5 gallon buckets in our kitchen and bathroom to collect water that can be used for watering perennial plants and trees. One of those buckets is in the bathtub specifically to catch the cold water before it gets warm. This is perfectly fresh, clean water that shouldn’t be wasted. In addition we are now saving some of our kitchen water. If you cook pasta, don’t salt it so you can use that water in the garden. If we’re rinsing off produce, we save that water. We save some dish washing water based on what we are cleaning and what soap we’re using. If it has touched raw meat, raw eggs, etc. it goes down the drain. All this water is getting used to water our artichoke plants, fruit trees, and various shrubs. I don’t use it on annual vegetables where we eat the leaves or roots. You can also save laundry water if you aren’t washing diapers. Besides saving water we’re also just reducing the amount we use. The saying “if it’s yellow leave it mellow, if it’s brown flush it down” is being said quite often around our house now. We also turn off the water when we’re brushing our teeth (which we all should do anyways) and turning it on only to rinse the dishes. Also, while washing dishes we run the water a lot lower. It seems that it rinses them just as quickly at a lower flow than at full blast so I hope to see a savings in that regard. Showers have also been shortened to just 5 minutes. I’m planning on getting a valve to add to the shower head so we can turn it off while we’re soaping up. By reducing the amount of water your garden and your household uses and by saving it, you can reduce your overall use of water enough to not have to feel guilty. And remember, the agriculture sector uses 75% of the total water so if you’re growing your own and following water wise guidelines you are helping reduce more water than just what you see on your bill.